The other day while I was busy shopping groceries, I noticed a woman staring at me. She had a confused look on her face. I couldn’t take it any longer and broke the ice with a friendly smile. Guess she was waiting for me to respond! With the same baffled look, she asked “I see you buying lots of okra. What do you do with this?” “Its so slimy ah I hate it!” she exclaimed! I explained her that frying/roasting okra (the way we Indians do) would reduce the sliminess. 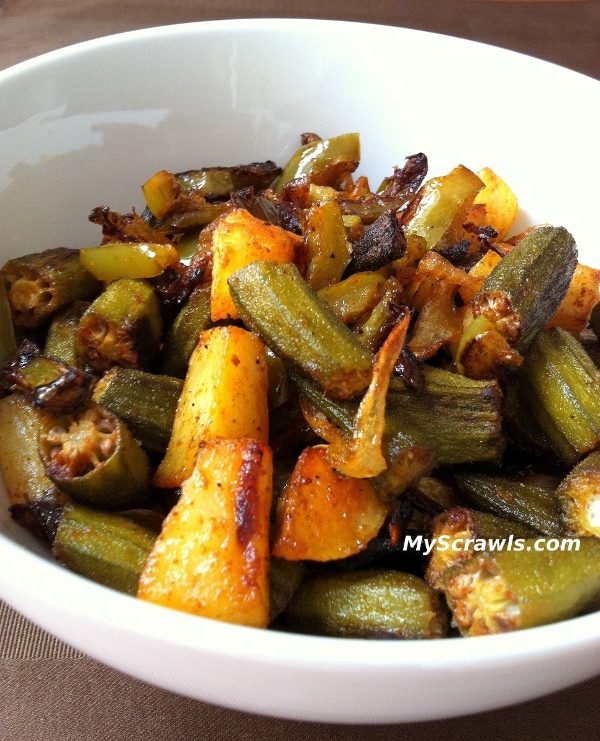 I even gave her the recipe for okra fry. Hope she tried it! In a big bowl mix oil, chilli powder, salt, hing, garam masala, pepper powder and ginger powder. Add the chopped veggies and mix thoroughly. Transfer to a baking tray and roast for 30 minutes. Roast till potatoes turn slightly brownish in color or until veggies are cooked and crisp enough.